Garnet is such a deep wonderful red color that can be used in so many ways, that the possibilities are endless. These wonderful gems in a pair of earrings are just what you need, especially with the amazing real heart shapes, which add the luxury of feeling elegant while wearing these amazing pieces of jewelry. The plates of the earrings are made with 14K White Gold, which is very classy added with the dark red heart gems. The 6mm gems are held in place in your ears with push backs, which are excellent in holding the earrings securely until you take them off. Push backs are fantastic in ensuring that these earrings will be 100% painless, as they won't pinch your skin, and you determine how tight or loose they are fitted onto your ears. Don't wait to buy these precious gems. 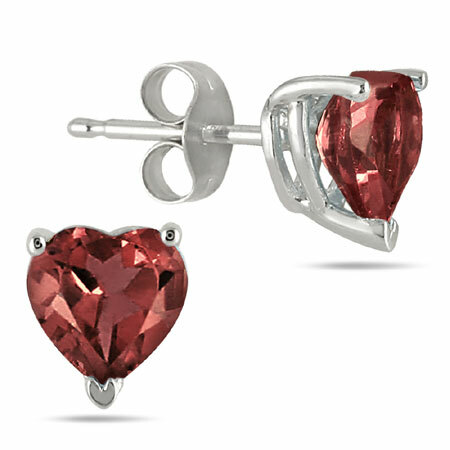 We guarantee our Real Heart Shape Garnet Studs, 14K White Gold to be high quality, authentic jewelry, as described above.